There hasn’t been a person on the moon since 1972. Friday marks the 49th anniversary of the first time any human set foot on solid, extraterrestrial ground. The details are probably familiar: on July 20, 1969, Neil Armstrong and Buzz Aldrin became the first people to walk on the Moon. It’s a rare privilege, even now: only ten other people have landed on the Moon and gone out for a stroll. Just over three years later, humans walked on the Moon for the last time. Changing political and economic priorities meant NASA would no longer focus on sending people to the Moon. After all, we had already planted a flag, confirmed that the Moon wasn’t made of cheese, and played some golf. What else is left? Well, it just so turns out that we might be heading back out there — and soon. President Trump has insisted on resuming manned Moon missions, despite the fact that it doesn’t match the public or scientific community’s desires for a space program (no one is quite sure where his determination stems from, but it doesn’t seem to have much more substance than a whim). But there are some other, real reasons that we might want to send someone to the Moon. There’s science to be done, and money to be made. Let’s dig a little deeper and see what might be bringing us back to our lunar neighbor. 1) Trump really wants it to happen. Last December, President Trump signed a directive indicating that NASA would prioritize human exploration to the Moon and beyond. Just imagine: a human setting foot on the Moon! Accomplishing such an impossible feat would show the rest of the world that America is capable of great things, which would really assert our dominance on the international stage! So, assuming that President Trump knows we won the space race 43 years ago (he knows, right? right?) there might be other reasons why Trump wants more people to go visit. Maybe it’s a display of national achievement, maybe it’s to develop economic or military advantages. Either way, the White House is pushing hard for that giant leap. A rare isotope called helium-3 could help us produce clean and safe nuclear energy without giving off any hazardous or radioactive waste. And it just so happens that the Moon has loads of the stuff (so does Jupiter, but that’s a bit harder to reach). While a helium nuclear fusion reactor does not yet exist, many expect that helium-3 could be the missing piece — and whoever secures the supply would unlock riches to rival Scrooge McDuck. Two years ago, the federal government gave a private company its blessing to land on the Moon for the first time. Moon Express, which also plans to dump human ashes on the Moon (read: litter) for customers who want an unconventional cremation, has the ultimate goal of establishing a lunar mining colony. According to the company’s website, Expedition “Harvest Moon” plans to have a permanent research station up and running by 2021. At that point, it will begin extracting samples and raw materials to send back to Earth. This could lead to more and (maybe) better research into the moon’s history and makeup, especially since our supply of samples from the Apollo missions is so limited. But helium-3 is what Moon Express is really after. And they’re not the only ones — the Chinese government also has its eyes set on the Moon’s helium-3 supply. In addition to opening space up to private mining operations, Trump has reached out to NASA in hopes that the agency’s technology could be used to launch mining rigs to the Moon and to asteroids. But there’s a lot that needs to happen before the spacefaring equivalents of coal barons start selling space rocks. For instance, we need to figure out how to approach and land on an asteroid, and to set up at least semi-permanent bases and mining operations. But still, some companies some companies are forging ahead. 3) Science! slash, practice for Mars. The government, along with multiple space-interested billionaires, have some well-publicized plans to colonize Mars. Their reasons range from: furthering scientific research, to exploring the cosmos for funsies, to saving humanity from, uh, something. The Moon could play a vital role in those plans — as practice off-world destination, and as a celestial truck stop along the way. In February, Commerce Secretary Wilbur Ross said that setting up a colony on the Moon will be essential for future space exploration. Especially, he mentioned, so that it can serve as a refueling station. His logic seems to be based on the fact that the Moon exerts less gravitational force than the Earth, so landing and relaunching a refueled rocket would let that rocket explore farther into space. Some have also proposed using a Moon base as practice for a Martian settlement, since they would be much closer to Earth — Moon-dwellers would only be three days from Earth, while human Martians would be eight months from home. NASA’s Gateway mission, as Time reported, could give rise to lunar settlements within the next ten years. Gateway would function as a space station in orbit around the Moon, but would be capable of traveling to and from the surface. The expected Gateway timeline is controversial even within NASA, however, as some feel that its far too optimistic about when we might actually see results. There are still too many unknowns and hazards for people in space settlements for such a program to succeed today. Even trying to simulate a Mars colony on Earth led to several unforeseen mental strains and complications. But either way, ongoing exploration and research missions continue to radically change our understanding of the Moon. 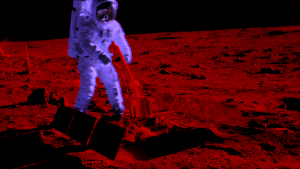 “Ten years ago we would have said that the Moon was complete dry,” Ryan Zeigler, NASA’s curator of lunar samples from the Apollo missions, told Futurism. “Over the past ten years, new instruments and new scientists have shown this to not be the case, and that has had profound effects on the models that predict how the Earth-Moon system has formed,” he added. Of course, there are financial reasons at the forefront the recent push for lunar exploration. But even if its just a pleasant side effect, we may get valuable new science out of these missions, too. Read more about complications with NASA’s lunar plans: NASA Just Canceled Its Only Moon Rover Project. That’s Bad News for Trump’s Lunar Plans. Want to Breathe on Mars? A Sea-Dwelling Bacteria Could Make That Possible. NASA Found Evidence of Organic Matter on Mars. Here’s Why That’s a Big Deal. Why Live on Earth When You Can Live in a Hole on Mars? No, Really.